BALTIMORE — Fears of a recession have been mounting with the U.S. stock market appearing to be headed for its worst December since 1931 — during the Great Depression. NEW YORK — U.S. stocks climbed Tuesday on another volatile day of trading as solid earnings reports from several big companies buoyed investors. Wall Street opened higher on Thursday as fears of a global trade war ebbed following signs that President Donald Trump’s proposed hefty import tariffs on steel and aluminum could exclude key trading partners. U.S. stocks overcame a brief stumble to close slightly higher Wednesday, snapping a two-day losing streak. Wall Street’s main indexes rose on Friday as investors looked beyond weaker-than-expected U.S. job additions in December and took support from signs of a pick-up in wage growth. NEW YORK — U.S. stock indexes flipped to losses in Tuesday afternoon trading after a recovery for technology stocks lost steam. NEW YORK — Stocks ended Thursday’s trading mostly unchanged, as cautious investors focus a large batch of earnings reports from U.S. companies, including Facebook and Merck. 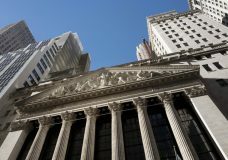 NEW YORK — The New York Stock Exchange stopped trading in the late morning Wednesday because of a technical problem, though NYSE-listed shares continued to trade on other exchanges.